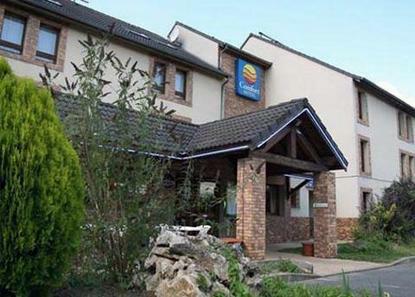 One of the best things about the Comfort Inn Chelles Marne la Vallee is its affordability. The location is also hard to find fault with. You can find this budget-friendly lodging establishment near Disneyland Paris, and that means that Paris itself is also within easy reach. When guests aren’t out enjoying all of the great area attractions, they can take advantage of the hotel’s facilities or relax in their clean and comfortable rooms. Among the facility highlights is a renovated parlor and lounge, and each of the 42 guest rooms features such delights as internet access and flat screen TVs with satellite programming. Guests of the Comfort Inn Chelles Marne la Vallee should have everything that they need in order to enjoy a rewarding stay. The hotel makes customer service its main priority, and the multi-lingual staff can surely be helpful. Also agreeable are the available amenities and facilities. This might not be a luxury hotel, but it certainly offers plenty of value for the money and can make for a wonderful travel base when visiting the Chelles area. Business travelers, it should be noted, have access to copy and fax services, as well as a meeting room that can accommodate up to 50 people. Also worth highlighting are the numerous things that guests can request in order to make their stays more pleasant. For families with small children, these things include bottle warmers, cots, infant chairs, and picture books. Other things that are available upon request at the Comfort Inn Chelles Marne la Vallee include irons, ironing boards, electric kettles, fans, and DVD players.